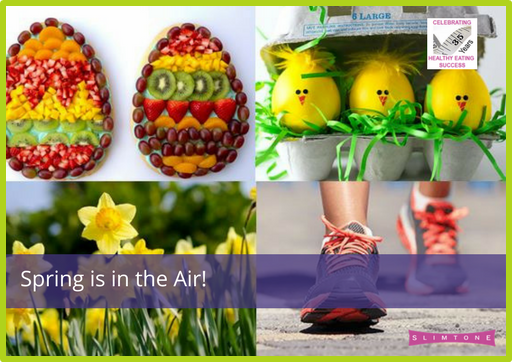 The clocks have changed, Easter’s here and Spring is in the air….as long as you don’t listen to the weather forecast, that is!! But no matter what the weather throws at us over the holiday weekend, it’s a great time to get out and about. Quite a few members have already been doing just that and during March have joined the Walk All Over Cancer campaign. Jean Cahart is doing really well walking 10,000 steps a day during March, raising money for Cancer Research UK and getting fit along the way! …and did you see her husband on the BBC Wales programme last week as he joined Gareth Thomas for the Silver Skydivers for Sports Relief? If the over 60s can do a parachute jump, we can all do a little more exercise! Walking is ideal, you can go at your own pace, as far as you want – and being outside always makes us feel so much better too. To inspire you a little more, we’ve had some great Slimtone successes recently too. Lucy in the Bettws class has lost almost 4½ stone – not easy when you have two teenagers in the house! Sharron is in the same class and has now lost an amazing 7 stone! And her neighbour Sonia, who comes to class with her, is now at target having lost 2 stone. Well done ladies, that’s fantastic! Of course, there’s also Alan in the Sainsbury’s class who has also lost a fantastic 7 stone and is looking very slim and svelte. Have you seen his pictures on Facebook? And one of our Maesteg ladies who has lost 4 stone has just won a competition in Bon Marche for a complete makeover – isn’t that a wonderful treat for her. These are just some of our amazing successes – keep an eye out for their full stories over the coming weeks. I’m sure this has inspired you to get up and go this Easter. It’s not all about chocolate eggs – remember “chocolate makes your clothes shrink!” Instead why not try a fruit or veggie Easter platter! Bright and colourful, with all your favourites, it’ll put a smile on your face that’ll last a lot longer than a quick sugar rush! Have a Happy, Healthy Easter!